What a fun photo! 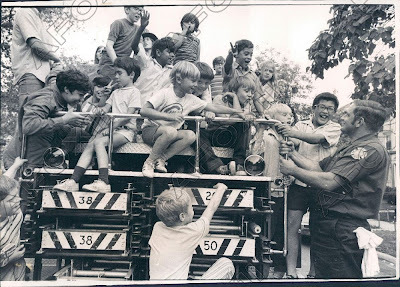 The firemen of the local Uptown station at Wilson and Racine let the neighborhood kids climb aboard the truck. Original caption reads: The children of Dover St. scramble for seats on a live engine at a street festival organized by the neighborhood association. Firemen from the station at Wilson and Racine avenues gave the kids rides. Thank you! This is what I want to find. I hope I could see more news from you.